An old nemesis will take charge of the Cobblers this weekend with Charles Breakspear appointed as the referee for their League Two clash with Cheltenham Town at Whaddon Road. The Surrey official felt the wrath of Sixfields back in October when he delivered a highly-controversial refereeing performance in the 2-1 win over Oldham Athletic, the highlight of which was his decision to send off Sam Foley three minutes before half-time. The Town midfielder went in strongly on Oldham’s Christopher Missilou but it was still a shock to most to see the red card come out and that was not the only decision to cause a stir throughout the afternoon, wit both sets of supporters feeling aggrieved by the end of the game. Foley became the ninth player to be shown red in the 17 games Breakspear had officiated at the time this season. Since, he’s given out another three to go with 119 yellows. 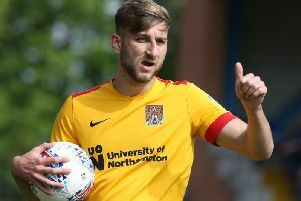 Remarkably, Foley was also the sixth different Cobblers player to be sent off in the last five matches refereed by Breakspear, joining David Buchanan, John-Joe O’Toole, Leon Barnett, Matt Crooks and Hildeberto Pereira. There was no such drama when Breakspear refereed Northampton’s Checkatrade Trophy defeat to Bristol Rovers in January.